In any other situation, you, the reader, would be a fool to pick the constantly-underachieving Charlotte Hornets to beat one of the top seeds in the Eastern Conference. 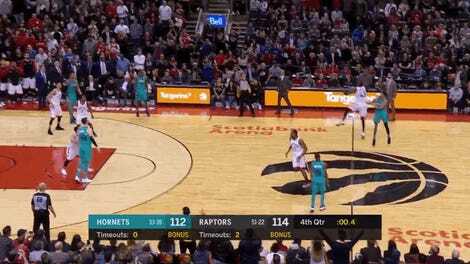 Yet the Hornets were able to beat the visiting Toronto Raptors on Friday, 113-112, because they happen to employ a player that appears to have some sort of vendetta against the league’s sole Canadian franchise: Jeremy Lamb. The Hornets were down just one point with 13 seconds to go and no timeouts left. 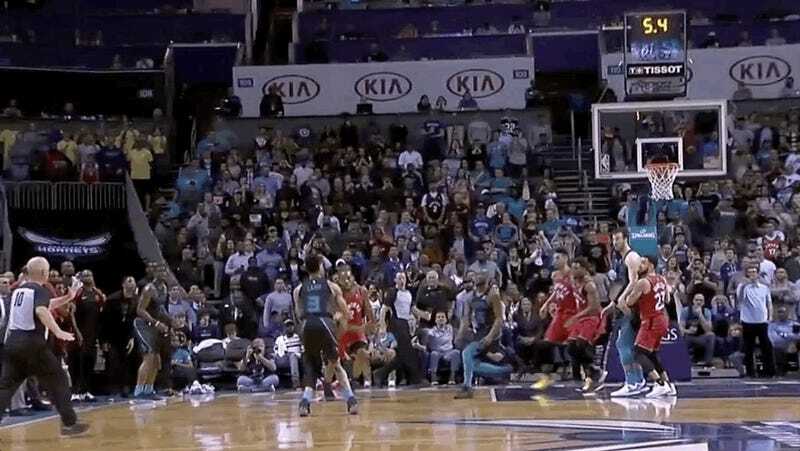 Kemba Walker took the inbound and raced down the floor to try and give his team a lead with a layup. 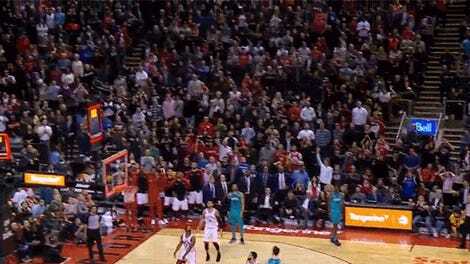 After drawing the entirety of Toronto’s defense to himself, Walker found his Raptor-killing teammate wide open behind the arc and threw him the perfect pass to set up the shot that became the game-winner. It really speaks to Walker’s talent level that he was able to force the Raptors to leave Lamb, the player that hit a game-winner in their last match up, that wide open. Sure, that shot was a fumbled half-court heave that actually beat the buzzer and stunned Scotiabank Arena into silent disbelief, but you’d think at least one player would be closer than about 10 feet (very rough estimate) from him. As for Lamb, it’s not entirely clear whether his clutch performances against Toronto are part of any active hatred of the franchise, or any sort of revenge plot, but what is clear is that he might have a reason to dislike the team. After his ridiculous buzzer-beater a couple weeks ago, someone posted a video in the Hornets subreddit of Drake hopping on the Raptors broadcast in 2017 and roasting the hell out of Lamb’s leg tattoo. I feel like Jeremy Lamb has the answers to the third quarter woes tattooed on his right leg. It’s cryptic. It’s cryptic. It’s drawing me in, boys. I don’t know. Something about it. What is that? What do you ask for when you get that? Give me the Da Vinci Code. I’m not saying Drake is directly responsible for Lamb becoming the Raptors’ kryptonite, I’m just saying it’d be hilarious if that was the case.